Since the release of the game in May, we have been listening very carefully to every comment made on the game. Forums, social channels, emails, reviews, survey made by and taken by our community... We already have released lots of free content and features to the game, including game modes, units, battlefields, dedicated servers, and more. 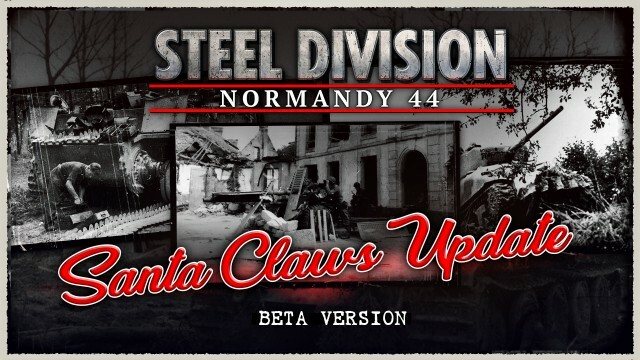 The next Steel Division: Normandy 44 update, "Santa Claws", will feature some significant meta changes, which aim to allow more tactical freedom, to increase the pace of the battles, and to make the game feel more authentic. As the changes are pretty heavy, we will make the beta version of this update available on Steam for everyone. As you can imagine, your feedback on this beta will be extremely important to us, and you'll be able to tell us what you think about these changes through a survey, available from Friday, December 8th. The beta and the survey will be accessible to everyone until Monday, December 11th. We are rebooting the ranked leaderboard on December 21st at 10AM CEST, which means this time for you. Online services won't be available for about an hour. Alongside the above-mentioned changes (well... if you like it), we're also working on some requested features, such as an active pause, private 2v2 breakthrough games, moddable DLC, and more. I wonder based on what and whos feedback you have decided that you need to increase the pace of the battles? Most new players are already overwhelmed with the pace of the action and amount of units that they should give orders to and deal with from opposition. In my opinion, you should have looked into ways how to decrease pace of the game/battle, so that this game would be more accessible to new and average players overall, but it looks like you are choosing opposite way and I don't understand why and who will benefit from it? WBA wrote: I wonder based on what and whos feedback you have decided that you need to increase the pace of the battles? Most new players are already overwhelmed with the pace of the action and amount of units that they should give orders to and deal with from opposition. In my opinion, you should have looked into ways how to decrease pace of the game/battle, so that this game would be more accessible to new and average players overall, but it looks like you are choosing opposite way and I don't understand why and who will benefit from it? This is not true. A lot of people around me including myself love long battles. The key which made us move "back" to Wargame: Red Dragon was the damage system, which was just to arcade to deal with it (even if we liked it, we would still play Wargame but also Steel Division). We were new to the game and we did not like the fact that a tank needs years (in comparision with the Wargame franchise) to kill a single infantry squad right infront of him. Even if they are surpressed and useless, it is just a thing most people including me don't like to see. Tactical failures should be punished with a punch in the face, not with a cut of a single hair. Now, since the global damage system has been updated, I'll redownload SD and try it again. If it is nice, friends gonna buy it too. Which means more players for SD. Most of them refund it on steam because of that reason. And I also think that other people also pointed that out. So, I'll keep an eye on the updates now because that sounds interesting to me. I don't know if you ever have played Wargame but in the Wargame franchise you die with infantry infront of a tank. Which doesn't mean your tank is OP. It is definitly not. Infantry has the upperhand in buildings, forest and so on but when moving in the open the tank gets visual and is dangerous to the infantry. This is a simple concept but effective because it just reflects the reality. Infantry squad infront of tank without cover = dead. I know I may be a little boring, but do you consider adding homogeneous movement speed option for units. It this the only thing in gameplay I feel lacking. I only wanted to answer a short bit on the meta, but it resulted in an endless text... sorry. I hope it feels good, it feels warm to me, you are so painfully close to the big win! Paradise in 500 meters! (One does like to have a good reading and not be annoyed about too much text. Novels sell like warm pizza! Have fun! Dont doom me! the tank pace was only a bit too peaceful to infantry, the slower killing frequency would be noting else than what C&C was, it virtually increases your health bar, not the one-shot-one-kill in AoW similarity. I dont understand why this was so cruel to people. Of course you dont fight with only 1 tank alone most of the time, except for an elite one, which does not have trouble with aiming, maybe the light tanks (not that useful if players miss some experience) could not even tickle some flank maneuvre, because even 4 or 5 tanks had trouble to kill something on long range. Vehicle? maybe. tanks? too less ap. Infantry? too low HE. so this leads to the escaping infantry, but on the other hand WW2 simulation is what includes those things, if tanks are like that historically, its rather a thing to communicate, not to 'update' into the 21. century tanks, instead, you take your jeep (maybe the only unit to chase infantry. maybe motocycle scouts can reach escaping infantry, thats all units I can use effectively for that, the normal units often miss offroad speed to catch infantry), so the best would be to capture those inf quickly, this would be a neat way to solve the accuracy with tanks on inf in ww2 style more, I think. The Change with the AT guns in town was a thing I wished to have had at day1, artillery is strong enough to counter this, it would just be similar to atgm inf in WEE, which was a vital mechanic, so thanks for that. The rest sounds good. I miss napalm games a bit I am reminded to those flame infantry in C&C1, in multiplayer it was strong to guard passages from infantry with single napalms. I think you messed the pointe a little bit with napalm units starting with WEE when it was quite good, becoming meaningless in WRD because other units were effective enough with short range anti inf, so napalm in C&C1 was a come into my short range, but then you are dead, and c&c generals and c&c3 did use flame units quite well (in c&c3 it obligatoryly suffered from being too rushable at start, and too massable with the flame faction of nod, that cabal had too much hp, so I have no problem to have a very low range with them, but they shall stop infantry immediately. even with a 2 men squad, I want to reach somewhat. the flame tank is now a bit better in SDN44 if it can at least cross a hedge to follow those guys when they escape into forests this was quite a bit lame before. In WRD the flame tank also should have a higher range into the forest, maybe within the borders it should pass the LOS at least in borders of forests, so you can snipe. It is VERY fiddely to snipe single units without a recon which gets killed too easy when you attack. the LOS should be a bit softer in WRD its tooooo pinpointed to exploit snipe-meta-gameplay when single strong tanks are not catchable, or just flanked and one-shotted when it was moved only some meters. I know I mix topics a bit but it belongs to the same big whole sense coming to make the day hard for players with those sniping issues at forests, that were too unfair for an attacker, mainly in WRD, in WEE the recon range was quite good. In SDN44 I often had problems to use my AT gun in the forest, because minimal LOS problems made them move, they became visible, if they slipped out of the stealth area for a splitsecond and got shot by tanks, so at guns only worked in hedgerows, but the forests with its irregular borderline (which is realistic) are a mastermind task for attacking generals, if you dont have the majority from surblasting economy to use twice as many units and scouts when this problem simply vanishes and destroys the tactical needs EVIDENTLY. I think the border-forest topic has too absolute results, too brutal for the weaker player, too difficult to handle with, you somewhat have too less units to fill the LOS with guns in a short angle, and on the other hand, you dont figure out how to pass through, and then with a majority you just rush a fortified nest, but the defender cannot do anything, I think that tactical options would be needed for the defender, that doesn't keep the enemy from entering, but if you would have mines, groundworks or fence fortification, in a tactical circumstances you would have other methods to give the defender an advantage like crouching and hiding, maybe a way to surpass intruding forces with a superior field of view WITHIN that forest (more view than LOS/range for guns), that would make tactical movement in mixed terrain more useful. Hills deserve a range advantage or a sight advantage you only have churches giving this for towns instead, there are some missing depth that is easy to use but useful to soften casualties for a weak player, so he has a way to save himself once he notices that his force is weaker. ... AND HERE COMES THE MOST IMPORTANT POINT I have with this game: WEE was fine, and with WAB and WRD you messed up a mistake in numbers, you have too scarcely troops to saturate a position you barely have enough resources for 1 unit per unit type, also in WRD, you cannot make a neat position, if you loose one unit, the whole mob looses, which (UNDERSTAND THAT PLEASE! ): opens a very PAINFUL weakness to the player, who has to watch all his troops loosing, if you loose your only and single - be it AT unit, be it AA unit, you just need to saturate a bit more and you solve A LOT of problems, also the border-forests, if you have some more units to help with, but you have NOTHING not a SINGLE available unit on the field to help in a close situation, without exposing somewhere completely, Wargame European Escalation made the scope SO WELL, you had BIG MAPS, ENOUGH troops IN YOUR DECK if your AA units are destroyed you can help with Beta-(I mean second quality AA for example) reserve to soften the punishmentso its not a total all or nothing all the time, in WRD and in STEEL DIVISION, the concept with Single units is FINE, but it doesn't fit into some unfair 'small things' that seem just UNFAIR to new players and THIS IS MY POINT, you punish weak players, without giving them a way to react, soften deficides, the FEATURE to use different veterancy to adapt were GENIOUS tools for a general, VERY realistic as you have different skills within your army, less Elite, but more regulars, but in WRD you have to choose EITHER OR, but you need BOTH on the field, you dont know what comes, its just UNFAIR to cut the decks so brutally! Give them more ROOM to fill the decks, its just TOO strictly CUT and WEE had it a bit softer, you had ROOM to switch a bit, off the stressful and embarressing situation to choose between very painful weaknesses, which you have to expose. you HAVE Friends, sympatisants EVERYWHERE out there, they still watch you, observe you SO many customers, waiting for you to make an offer they can invest their money in, they would also pay if you would come with less, DEFINETELY, if you were better in selling what you have, because you are better than you say, you just dont sell yourself with your actual power you have in the game, its worth so much more what you did, Telling what you are about to do is a GREAT advancing, even if you would not reach the timeline, having Wargame back in mind, we know what you are capable of, now GATHER THE PEOPLE of a famous RTS PLEASE! You need some french ambiance like in a rich restaurant with the beautiful smell of pizza, and welcome environment and so on, you HAVE the best pizza, but one feels you have so much pressure making the game a player can feel it if he plays that you have pressure, the players must take that part they are guilty too, they are silly, and silly everywhere, but its just same as easy to lure players into your famous restaurant with a tasty smell outside. Now you asked for feedback, players tell you a lot, I hope you can understand me, I will fill your survey, I want good pizza and good strategy games WITH PEOPLE TO PLAY! I mean, I like the idea of hedgerows being crossable as it adds a few more tactical options, but I really don't want to see a return the the absurd situations in RD where infantry were just an inconvenient speed bump and you could clear forests with tanks..